Do I Really Need to Wear SPF? Last week I popped to see Dr Marko Lens, who is fast becoming one of my favourite people in the world of beauty, science and…just in general. His sense of humour is even more bonkers than my own, yet he’s a leading expert in the field of skin cancer and completely and utterly captivating when he talks about skincare. I asked him a few – very basic – questions about suncare and SPF mainly because I wanted to clear up some of my own doubts, and the results of this little chat are below. In the video. Yes you have to watch it – if I had a secretary I’d get her to do a transcript, but I am unfortunately lacking in that particular department. I’ve listed some of my most-used SPFs below, just for ideas. 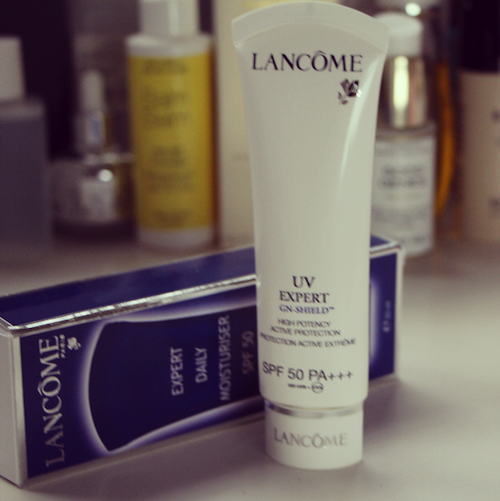 My most-used at the moment is the Lancome SPF50 (FeelUnique.com) – it gets on quite well with my skin and doesn’t feel too chalky or look too pasty-white. I also love the Dior one that I bought from FeelUnique a few weeks ago, though it is very scented. It smells like Caudalie’s Divine Oil! Watch the video here if you’re on email, or scroll down for web users. For those wondering about Vitamin D with all of this SPF then I’ll put together a post soon – I take a supplement, because my levels are really low. Always have been, even when I wasn’t quite so religious (ahem) about applying SPF… I take this Vitamin D supplement here but please check with your doctor to see which strength you need if you want to get yourself sorted. Previous Post Quickfire Beauty Reviews..
Next Post HUSH Summer Sale!